As every hockey fan knows, the NHL is considered the premier professional ice hockey league in the world. The sport at its finest. Whether you’re following your favorite team or working towards your shot at the big leagues, you know that the most exciting plays and the biggest moments all happen there. As the official supplier of uniforms and NHL apparel, adidas has everything you need to get game-day ready. 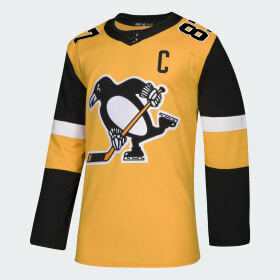 Suit up like the pros in Adizero authentic jerseys featuring official team crests and NHL logo shield. Shop clothing and gear like tees, hats, hoodies and jackets to rep your team from off-season to post-season. For creators at every level, adidas hockey has you covered.